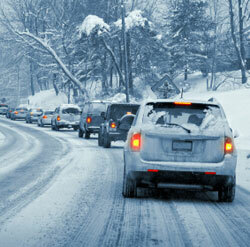 Winter driving is often white-knuckle driving. Snow, ice, wind and the early darkness can make even a routine commute an adventure. But AAA has some advice for staying safe once the snow starts to fly. Make sure you are well rested before you start. Winter driving is difficult enough without being tired. Never warm up your car in your garage or other enclosed area. Make sure your tires are appropriate for the season and are properly inflated. Don’t mix radial and non-radial tires. Keep your gas tank at least half full to keep your gas line from freezing up. Don’t use cruise control on snowy or icy roads. Keep an eye on the weather reports before you leave. If bad weather is expected, don’t go if you can avoid it. If you must travel, make sure someone knows when you are leaving, what route you are taking and when you expect to arrive. Have your car serviced before winter arrives, and make sure it is running smoothly before you leave on a long trip. When your gas tank gets to half full, stop and fill up. Pack an emergency kit for you, with a cell phone, food and water, blankets, extra clothes, flashlights, medications, etc. And pack an emergency kit for your car, with flares, sand and a small shovel. If you get stuck, don’t leave your car. It gives you shelter, and it is easier for searchers to find your car than to find you wandering around in the snow. Tie a bright-colored cloth on your antenna or the top of your rolled-up window. Keep the dome light on after dark, so rescuers can find you. Make sure the snow is not blocking your exhaust pipe, which could cause carbon monoxide to back up into your car if you run the engine. Then run the heater only as much as you need to keep from freezing. Do everything more slowly than normal. Accelerate and decelerate slowly. Give yourself at least two or three times as much distance between you and the car in front of you, because it takes longer to stop in snow. Take turns slowly. Know your brakes. In fact, AAA suggests practicing your snow driving techniques in an empty snow-covered parking lot. Regardless of whether you have antilock brakes, brake with the heel of your foot on the floor and use the ball of your foot to apply firm, steady pressure. Keep going if possible. It is a lot harder to get going from a full stop in snow than it is to keep going, even if you have to slow down until you are barely moving. And don’t step on the gas to get up a hill; you will just skid. Instead, try to get up a little speed before you get to the hill, and then go up at a slow but steady pace. Most importantly, AAA says, don’t drive in bad weather if you don’t have to. And remember that even if you are an excellent driver in snow, the other guy might not be. So don’t take unnecessary chances.